Product prices and availability are accurate as of 2019-04-17 20:26:04 EDT and are subject to change. Any price and availability information displayed on http://www.amazon.com/ at the time of purchase will apply to the purchase of this product. 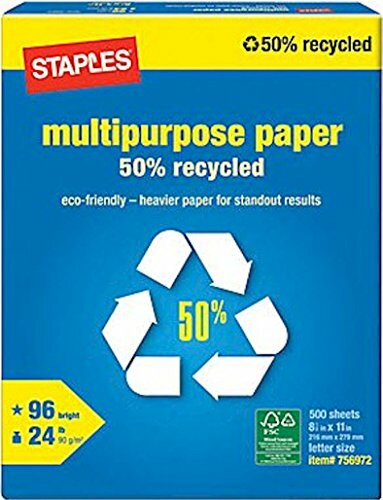 Staples 8 1/2" x 11" Multipurpose paper offers superior quality and bright white finish for professional prints. Smooth/smudge-free performance and is acid-free. Paper is highly efficient and doesn't turn yellow over time. Compatible with most office machines, copy machines, laser and inkjet printers, and plain paper faxes. Sold as single ream of 500 sheets.